Andy Cico is a freshman from Hampton NH. He is extremely excited to be spending his first year in college with Mad Ave and is enjoying doing what he loves with such a great group of guys. Andy had never sung before a crowd until his freshman year of highschool but the moment he did he knew that no matter where he went in life he was going to keep singing forever. On top of his passion for singing he also loves performing in theatrical productions, video games, playing D&D and other things that only cool people like to do. He can't wait to help share Mad Ave's great sound with anyone who will listen. Tyrik Once is a Sophomore at Drew coming from Carteret, NJ the home of… well nothing interesting at all. He has been singing for about a year but has been involved in many music programs such as chorale, orchestra, concert band, wind ensemble, percussion ensemble, concert choir, marching band and his school’s a capella group, Varsity Vocals. When he’s not at a MadAve rehearsal, he’s probably studying for his intended major, business, taking pictures for his intended minor, photography, or just running. If you don't come to the concerts, he will hunt you down. Jack Andrus is a Freshman at Drew, hailing from world-famous seaside resort town Oakhurst, New Jersey. (Before you ask, it’s 10 minutes from Asbury Park.) He’s pursued music since fifth grade, when he met his first love: the clarinet. He didn’t start singing, though, until eighth grade. After miserably operating a spotlight for the school musical, he thought: “They’re definitely having more fun up there than back here.” And so it began! His entire high school career was a pursuit of all things musical and theater, complete with a cabaret, two choirs, three bands, four musicals, and five plays. That led both to his insanity and to his decision to double major in Theatre Arts and Music here at Drew. If he isn’t onstage, in rehearsal, or looking for an open practice room, Jack is probably near a piano working on a new composition, or slamming his head against his desk wondering why he elected to take seven classes in his first semester. Nevertheless, he’s thrilled to add the famed MadAve to his list of commitments! Caleb Dean is a Sophomore Theatre Arts Major at Drew University, originally from Chattanooga, Tennessee. As a guitarist and vocalist, he's truly found a home for himself in music. Over the last year, he's enjoyed all of the excitement Mad Ave has to offer. All of the late night rehearsals and inside jokes have given him a good source of entertainment throughout the last two semesters. When not singing baritone, he's proud to be the percussive glue that holds the group together. 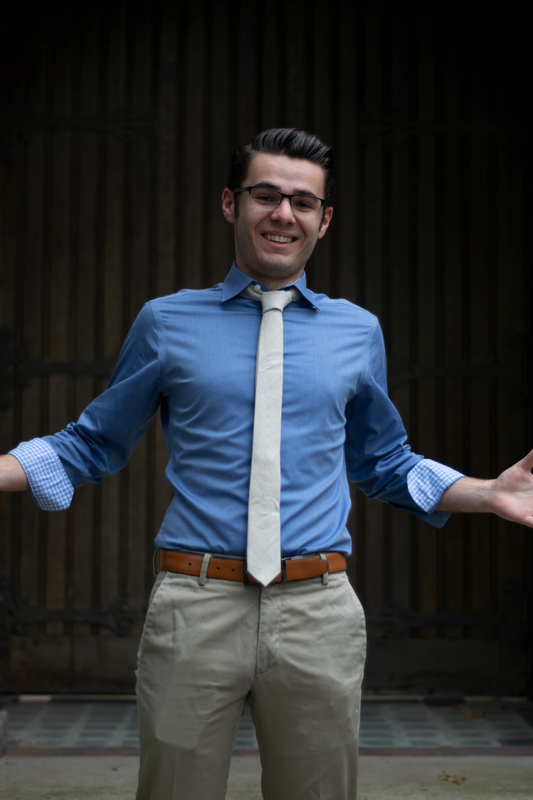 Joseph Bouffard could not be more thrilled to spend his last year as a baritone & beatboxer in Mad Ave. He is from Green Brook, New Jersey who’s been heavily involved with the music realm for so many years. Everything from playing various instruments, performing in the School of Rock program, singing in high school choir to which he was awarded the national senior choral award, and even playing as a lead percussionist in marching band has collectively invigorated him with musical talent. So, it was no question that Joe was to join college acapella. His influences encompass a wide spectrum of everyday Rock & Roll, pop, hip hop, classical numbers, and even jazz tunes. However, his most notable influences are his choir director Angela DiIorio Bird, his drum instructor Joey Cassata, his guitar instructor Michael Eckhart, and the Canadian rock band Rush. Outside of rehearsals, Joe enjoys jamming with friends and family, listening to his favorite tunes, supporting the New York Yankees as the best team in baseball, and just spending time with his friends and family. That being said, Joe could not be more excited to spend his last year in college with his brothers in 36 Madison Avenue. Nicco Grillo is from West Trenton, NJ, and is currently a freshman at Drew. He spent 3 years as a member of the American Boychoir School, and 3 years as a member of Lookin' 4 Treble, an acapella quartet he helped create. In addition to being a member of Mad Ave, he is also on the fencing team. He enjoys Magic: the Gathering, a trading card game, and he also runs two individual Dungeons & Dragons games. With all these nearly male-exclusive activities, you might assume that his life is pretty much a female-free zone. You’d be right. Ryan Joseph is a Freshman at Drew University, from Long Valley, New Jersey. Sometimes he says the word coffee a little weird. He has had musical experience from high school, but never any formal choral experience. He plans to major in English and Theatre Arts, which leads to getting an MAT to teach. He really doesn’t do anything in his freetime, he’s really lazy. But he’s a nice person and uses sarcasm as a defense mechanism. See him in Mad Ave! Andrew James Keenan is a Senior at Drew from Brooklyn. NY studying business and theatre at Drew. He’s been singing since he once wandered into his high school choir class and proceeded to stare blankly at sheet music. Nowadays, Andrew’s stares are far less blank, and after four years of not-so-hard work, he can finally say he’s rhythmically competent. Outside of MadAve he’s often following hockey, talking about his cat, or engaging in some sort of shenanigans. He's an avid fan of Star Wars, he still can’t ride a bicycle, and can do several not-so-bad impressions. He extends his best wishes to Bachelor in Paradise contestant, Jordan Kimball, following a heartbreaking season’s end: “We’re with you, brother. Move with the cheese.” Andrew is beyond excited for his fourth and final year as a member of 36 Madison Avenue. Miguel Angel Plaza III is a Sophomore at Drew torn between a major in music and computer science. He’s always out and about with music blaring with him in some way, shape, or form. Whether it is coming from his headphones or he’s belting loudly for the world to hear, the tuning and grooving never stops. But, for the few times it does, Miguel enjoys going to the movies to see whatever, whenever. From large scale super hero movies like Avengers: Infinity War to random, raunchy comedies like The Love Guru. He also likes working out, sleeping, or hanging around with his buddies trying to making music on a large scale, seeing if one day they can make it big. Miguel has High, High hopes for this year and can’t wait to take them all on with his MadAve family. Ben Schneider is a Senior at Drew from the suburbs of Newington, CT. He has been singing since he was exactly 4 years old, at which point he was completely tone deaf, and his passion for choral and a cappella music has shaped his whole life since then. Nothing he has ever done, though, compares to the 3 note baritone lines he gets to sing with this group. If he wasn't a music major, he would be sad, and likely doing nothing at all. His favorite hobbies include being contrary, thinking too hard, and discussing pop-culture irreverently. Don't ask him about a cappella, or you may never get out alive. He absolutely loves being a part of MadAve, and he is thrilled to be geeking out with such a promising crew of singers. John Thatcher is a Sophomore from northern Maine. He has been singing for a long time for a lot of different kinds of choruses (kindergarten concerts are some of the most noteworthy), and has been involved in many theatrical and musical productions over the years. He intends to major in music with minors in theater and Chinese. 36 Madison Avenue is his first experience in an a cappella group, which will make a fantastic addition to his repetoire of musical activities in his life. So far his experience in the group has given him a chance to show his soul to his group and his audience, and it is his favorite part of College by a long shot. He loves movies, games, various kinds of comfort food, and his black labs Falafel and Willow. He is crazy excited to be a member of such an amazing group, and plans to make new friends and have multitudes of new experiences throughout his career within 36 Madison Avenue.